Do you dream of furthering your education, but you’re not quite ready to take the plunge? Do all of those programs and schools out there overwhelm you? You’re not alone! Deciding to go back to school can be very overwhelming, but you’ll feel so uplifted with confidence once you start your training, giving yourself a leg up in the world. Also, our short programs will fly by and before you know it attending Cambridge Junior College will be a happy memory. Let’s look to Xochitl as an example. Xochitl Rojas Ortega used to attend Butte College while working as a part time sales associate and cashier. 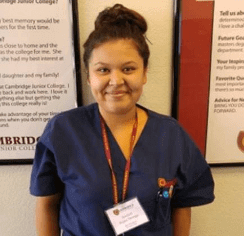 Sensing a need for change, she did some research and chose Cambridge Junior College’s Medical Assistant Program “because it seemed like the perfect fit.” Good instincts Xochitl! Her intuition paid off as Xochitl found a stellar program! Additionally, you will complete a medical externship. This is invaluable experience, which allows you to learn directly on the job in a clinical healthcare environment. You can also begin to network, creating industry connections. But Xochitl’s goals don’t end there. She has set her sights on furthering her education even more. Xochitl’s future goals are, “keep furthering my education and become a phlebotomist or a LVN/RN.” We know you can do it Xochitl!